Angela Rossitto is a contemporary artist and current PHD candidate at RMIT, Melbourne. Rossitto’s PHD project examines how ‘deep time’ can be materialised in practice-led research, through direct hands-on investigation of fibre and light. Scottish geologist James Hutton’s fieldwork and theory, deep time, led to uncovering Earth’s true age and later, the universe. Geological time divides all Earth-time into sections based on rock and fossil remains, while cosmological time considers the origins and fate of the universe, irrespective of humanity. Despite this brief existence, humanity is said to have irrevocably altered the Earth, thus our current era is termed the Anthropocene. Rossitto's research investigates deep time from a cosmological standpoint, considering fibre and light, as integral to the human story, and indicative of life and time. Fibre has been derived from nature since the Upper Palaeolithic period, while light is primordial, its beginning is that of the universe. The installation artworks resulting from this investigation stimulate perceptions and reflection on deep time and one’s very existence. 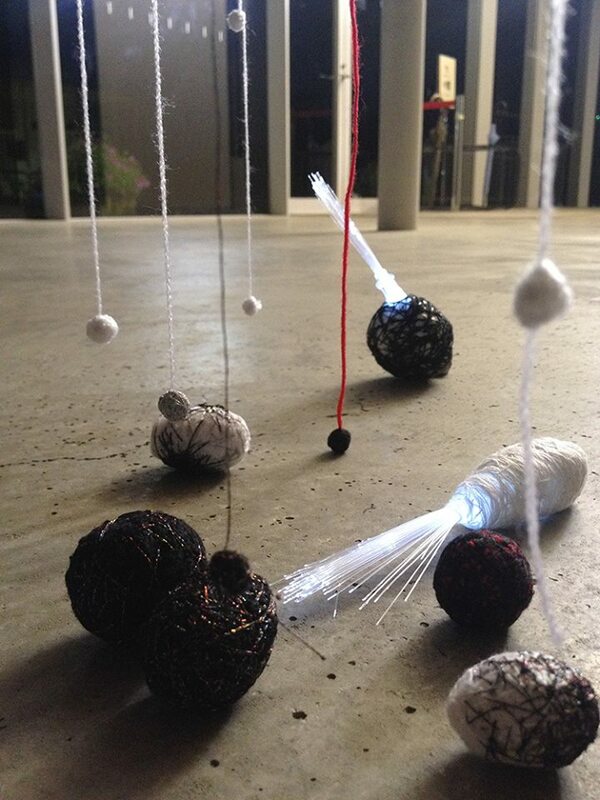 Image details: Angela Rossitto 'Small Wonder’ (2015) nawa (rope), cotton, wool, LEDs and fibre optic filament.